Trainer Jessica Dabkowski helps prep your horse to cross water without a fight. Sometimes water can be scary for even the most experienced trail horses. Water looks different to horses than it does to people. If the water is muddy, horses can’t tell how deep it is. If it’s moving and splashing, it may feel cold and shocking on their legs. Your horse trusts you to help him cross at a safe location and where the water isn’t too deep or running too fast. If you’re not sure whether your horse has ever crossed a stream, it’s best to take your time and assume that he needs your help. Here’s how to prepare your horse to approach water with confidence. Be prepared before you hit the trail. 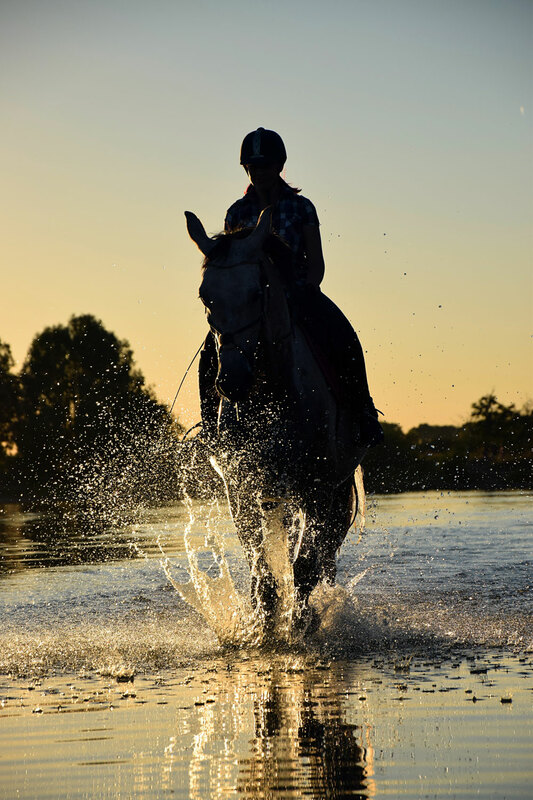 If you teach your horse to approach obstacles confidently, you’ll have the skills you need to conquer water. You can practice at home with a tarp. Use a rope halter and long lead and send your horse away from you and toward the tarp. If the tarp is to your left, raise your left hand (as it holds the rope) up and toward the obstacle to cue your horse to move forward in that direction. It’s great to have a flag or stick in your right hand to motivate your horse to move on, and to keep him out of your personal space. Simply waving the stick or flag will encourage your horse to move forward, even if you don’t touch him with it. Once your horse moves forward, release the pressure and allow him to rest. Make sure to reward the slightest forward motion by giving him a break. Keep up this practice until your horse is willing to move forward over the tarp. It’s much less scary for you and your horse when he takes the first steps while you’re on the ground. From the saddle, make sure you keep your horse facing the obstacle. Ask him to step forward by using your driving aids; move your arms forward and add leg. Reward your horse with a break (but don’t let him turn) when he takes a step forward. Once your horse will willingly cross obstacles at home, you’re ready to try your “move-forward” skills at a water crossing. Practice water training when you have lots of time to work back and forth across a stream or creek that is shallow and fairly narrow, with plenty of open space. Hint: Ask other trail riders in your area where easy water crossings are located, and be sure to find out how fast water is running on the day you want to ride. Approach the water crossing just like you approached the practice obstacles at home. Your confidence and precise cues will help your horse know where to go. If your horse seems worried about the water, dismount and put on a rope halter and long lead. Send him across the water just like you did with new obstacles at home. The more you practiced at home, the easier it will be to send him across the creek. He’ll understand the cues, and you’ll see how he responds. Keep your horse’s nose pointed at the water crossing and don’t allow him to turn away. Quickly turn him back toward the water if he attempts to even glance to the side. Apply your leg aids to cue the horse forward and keep your reins forward. If your horse seems worried, you can try asking a friend to ride in front of you, as long as you know your horses get along and that her horse won’t kick. As soon as they cross, cue your horse forward to see if he’ll follow. You can use his herd instincts to help him feel calm and know that other horses think it’s safe to step in the cold and moving water. Once your horse willingly steps in, it’s time to celebrate! Praise him and give him a rest. Ask him to go back and forth a few times so that he understands that crossing water isn’t something to blast through quickly. It’s OK to allow him to play a little and get a drink and relax a moment in the water, but be aware that some horses like to lie down and roll in it. Apply leg pressure immediately if you feel your horse’s knees begin to bend! If you know your horse is prone to rolling, make sure to keep him moving forward. The next step is to ask your horse to walk up and down the water (if the footing is safe) and allow him to stop and feel the water rush on his legs. When your horse is willing to keep his head down and step through water at the speed you want, you’ll know he has accepted water crossing as a natural occurrence. This should lead to many more happy trail rides with your friends, knowing that water is no obstacle. Trainer Jessica Dabkowski, of Pony Peak Stangmanship in Laporte, Colo., focuses on natural horsemanship techniques while training Mustangs and all breeds of horses. 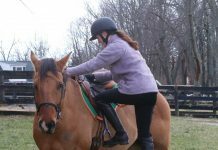 She often works with young riders to help them prepare for Mustang Makeover competitions.